Master distillers from Scotland are wrapping up a three-day visit to George Washington’s Mount Vernon estate to whip up a special batch of Scotch whiskey. On Wednesday the distillers will fill specially constructed oak barrels with the hand-crafted single-malt liquor to begin a three-year aging process. The distilling is the latest in a series of limited production runs that have been done at George Washington’s reconstructed distillery. After the Scotch is aged, a limited edition of 100 bottles will be auctioned off for charities around the world. In 2006, distillers using Washington’s recipe for Rye whiskey produced bottles that sold for $100,000. 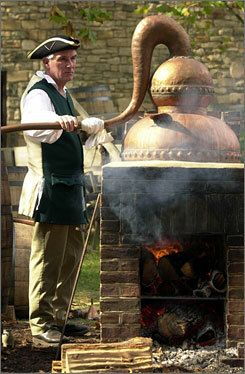 At the end of the 18th century, Washington’s distillery was one of the largest whiskey producers in the country.